first you need to find an old circuit board. mines from an old school project. find a section of the board that has a line of copper connection under it. cut it out to fit the size of the psp's input , WITH THE COPPER LINE ON THE EDGE. next, flip the circuit board you cut out, and shave the black coding off where the circuit board is going to connect into the psp. this is so it will fit into the psp when the wire gets soldered onto it. after that, solder a wire to the copper AWAY from the side you will be plugging into the psp. next find an old pair of headphones. 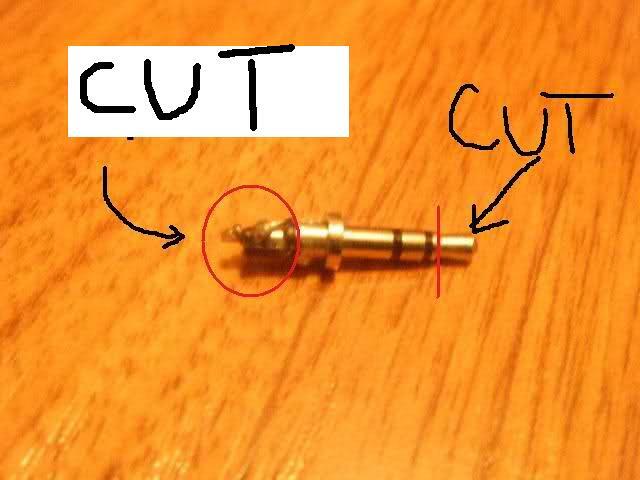 cut out the input. it should look something like this. next cut off the tip of the input. if you dont, your psp speaker will not work. your psp will think headphones are in. to cut this tip off i used a grinder. now you are done. make sure your circuit board connection is hitting the first top pin on your psp mic input. then plug the headphone jack into the psp headphone jack.